Tetanus vaccines, insulin and hygiene items all requested and shipped to local health facilities. It’s been almost two weeks since rains from Hurricane Florence began to deluge the Carolinas. At least 47 people across multiple states have perished as a result of the storm, and many remain displaced, living in shelters that have opened up to house evacuees. Direct Relief has been working with local health centers and free clinics to deliver requested medicines and supplies as they work to treat patients impacted by the storm, in shelters, mobile clinics and inside facilities across the coast. Tetanus vaccines were shipped Wednesday from Direct Relief headquarters to Goshen Medical Centers, located throughout North Carolina. Goshen staff will be providing vaccines that protect against tetanus, diptheria and pertussis. These vaccines will be administered to people that have evacuated to local shelters but will be returning soon to damaged or destroyed homes. People cleaning up from storm damage can be at risk of tetanus, a bacterial illness transmitted through a cut or wound. Many shelters housing evacuees have also requested hygiene items for displaced residents. 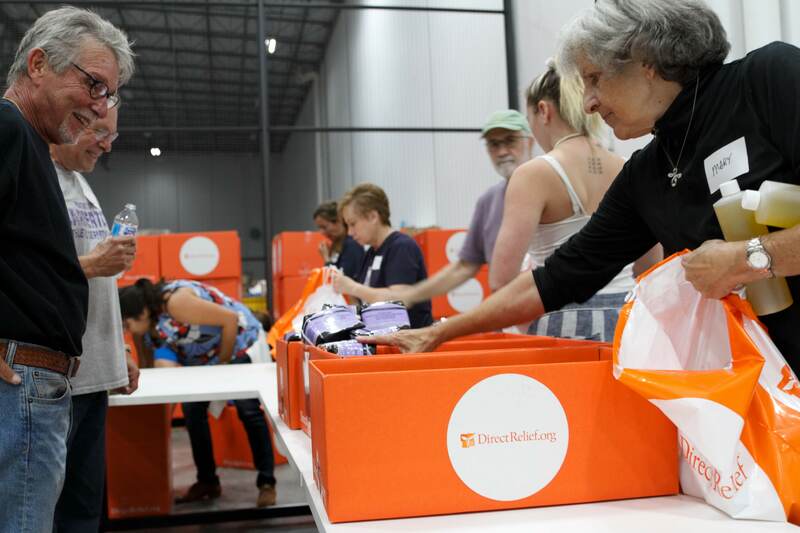 Last week, volunteers gathered in Direct Relief headquarters to pack items like shampoo, soap, toothpaste and other essentials for people in need. More shipments of critical aid will be leaving Direct Relief’s warehouse this week.